Thanksgiving is America's signature holiday: a day of feasting and counting blessings that unites us as a nation. Before you sit down to watch football or devour a drumstick, take this Thanksgiving Trivia Quiz! It will not only test your knowledge of holiday history, traditions, and lore, but it will also spark your interest in the New England origins of Thanksgiving and remind you why we give thanks each November. Do you have the gizzards to be a Top Turkey? These questions get progressively more difficult, and you'll find the answers by scrolling to the end of the page. Whether you get all of these trivia questions correct or your goose gets cooked, have a Happy Thanksgiving! Good luck! Which wild bird was NOT on the Pilgrims' First Thanksgiving menu? What was the name of the Pilgrims' ship? What landmark is known as the place where the Pilgrims landed in America? The Native American Indians who celebrated the First Thanksgiving dinner with the Pilgrims were from which tribe? A successful barley crop enabled the Pilgrims to wash down their Thanksgiving feast with what beverage? What event inspired a US President to proclaim Thanksgiving an annual holiday? The Pilgrims' three-day Thanksgiving festival, a feast for 50 colonists and 90 Indians, was prepared by the surviving married women among the Pilgrims. How many "hostesses" were there? Which of these U.S. Presidents could claim Mayflower ancestry? Thanksgiving Trivia Quiz Answers: How Did You Score? Question 1: D is the correct answer. The Pilgrims did NOT eat bald eagle at the First Thanksgiving. Question 3: The answer is C. The Pilgrims came to America aboard the Mayflower. 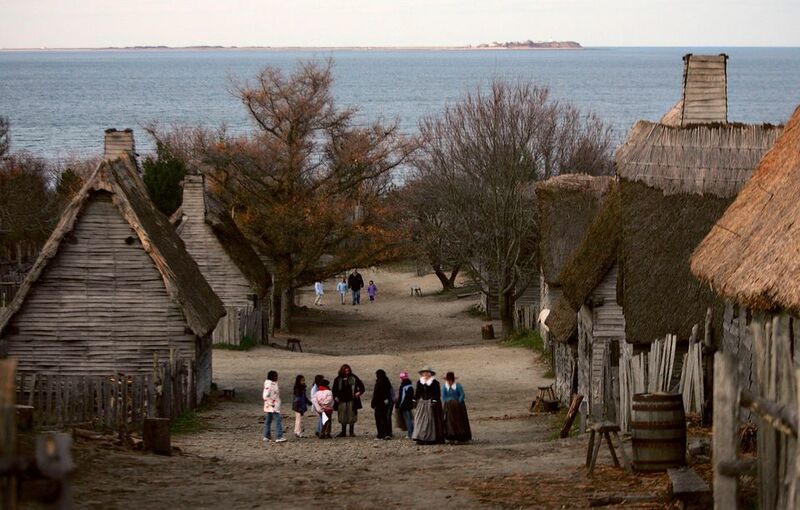 Climb aboard a replica, the Mayflower II, when you visit Plymouth, Massachusetts. Question 6: The correct answer is B. Thanksgiving is celebrated on the fourth Thursday of November each year in the U.S. Here are the Thanksgiving dates for the next few years. Question 7: It's answer B! The Pilgrims landed first at Provincetown on the tip of Cape Cod before moving on to Plymouth, Massachusetts, where they established their permanent settlement. That's why the Pilgrim Monument is in Provincetown. Question 9: The answer is B. It wasn't Sam Adams, but the Pilgrims enjoyed their own microbrew with the first Thanksgiving Dinner. Question 10: I warned you these would get trickier! The correct choice is D. Oceanus Hopkins was born aboard the Mayflower during the Pilgrims' two-month voyage to America. Question 11: D again! The Mayflower was a wine vessel before its historic role as the Pilgrims' America-bound transportation. Question 12: B is right! The Spaniards brought the first turkeys back to Europe from Florida. Question 13: Did you choose C? Right! President Abraham Lincoln proclaimed Thanksgiving a holiday in 1863, three months after the Battle of Gettysburg in the American Civil War. Question 14: It's B! The job of preparing the first Thanksgiving feast fell to the four married women who survived the Pilgrims' first winter in Plymouth. Question 15: C is correct. George H.W. Bush is a descendant of two Mayflower passengers, John Howland, and Francis Cooke. Other U.S. Presidents with Mayflower ancestors are John Adams, John Quincy Adams, Zachary Taylor, Ulysses S. Grant, James Garfield, Franklin D. Roosevelt and, of course, George W. Bush. Did you get them all right? Are you a Top Turkey?